KDNK's arts related Public Affairs program. Today's show features Sarah Pletts, Aspen-based dancer, painter and playwright. We also hear from the Wilderness Workshop's Development Director Rebecca Mirsky about the Wild Feast, a benefit dinner next Wednesday at Justice Snow's in Aspen. And local dancer and choreographer Alya Howe explains her new piece, HEaRD, which receives its premiere tonight at the Launchpad and then plays again tomorrow night, November 12. 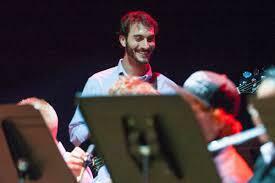 Basalt Middle and High School Band Director Nick Lenio is a semi-finalist for the 2016 Music Educator Grammy award. Yes, a real Grammy, the one people go to LA to receive. Lenio is in a group of 25 that has been whittled from over 3,000 entrants. He finds out in December if he makes it to the top 10. He joined KDNK's Amy Hadden Marsh on the October 25th Express Yourself show to talk about his work.